Imagine you are a civil servant. You have just convinced your somewhat skeptical colleagues that your new policy initiative should incorporate extensive public participation in its design process. You now have some tough choices to make: who is going to participate in the process, for example? You know that if you keep participation open to all, then the process will be criticized within your department for just involving the usual suspects. But if you restrict participation, to a randomly selected group for instance, then you know there are some influential policy NGOs who will be vocal about their exclusion. Or imagine you are a citizen who has decided to get involved in a participatory governance initiative. You were told this initiative was going to give you an opportunity to hold policy-makers to account. But, now you’re taking part you realize it is more about working collaboratively to input your ‘experiential expertise’ into the process. You also have some choices to make. Do you try to rattle the cage from the inside, or comply with the rules of the game and play nice? Or do you simply stop participating at all? Participation can take many forms as well as many meanings. This is part of what makes it beguiling, why it is attractive to liberals, radicals and authoritarians alike. However, this means that when we create opportunities to participate or when we decide to participate, we often do so with complex, even contradictory, assumptions about what participation means underpinning our decisions. This can result in frustration and failure. Unlike other contested terms such as liberty, fairness and justice, there is no considered literature exploring the multiple competing values attached to the idea of participation. The most common approaches to categorizing participatory initiatives rarely do this. They mostly take one of two approaches. Either they categorize types of participation from best to worst according to a radical participatory worldview (Arnstein’s influential ‘ladder of participation’ is one example), or they classify them according to features of institutional design (such as how participants are selected), without reference to the broader values that inform the design. 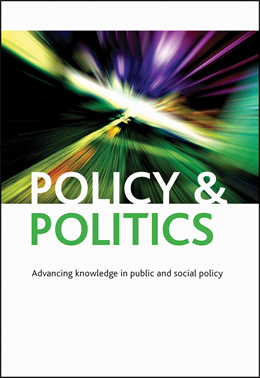 In my recent Policy & Politics article, ‘Beyond Radicalism and Resignation’, I propose an alternative approach, attempting to understand different modes of participation from within different traditions in democratic and public administration theory. Most social science research on participation focuses on participation in the process of democratic will-formation through electoral politics; whether people are voting in elections, joining political parties, writing to their representatives, signing petitions, and so on. It stops short of the interpretation and implementation of democratic will into concrete policies, which remains a black-box. This is important because much political contestation occurs in this realm of public administration, providing opportunities for those with access to steer implementation towards their agenda. In addition, the public most commonly encounters the state through these processes of implementation or as users of the resulting services. This has led the democratic theorist Mark Warren to argue that the democratization of policy administration provides the greatest opportunity to transform democracy since the rise of mass electoral democracy in the Nineteenth Century. I produced a typology of four modes of public participation in policy decisions, focusing upon public administration rather than electoral politics. These four modes are structured upon two dimensions that underlie many of the persisting cleavages in political theory (see Figure 1). The horizontal dimension captures the extent to which relations within the participatory space are characterized by: a) conflict between individuals and groups asserting and defending their own interests and values (agonistic), or b) people working collaboratively as interdependent members of a social whole (solidaristic). The vertical dimension captures the extent to which the rules of participation – for instance, the agenda and who participates – are imposed from outside the space (prescribed) or decided from within the space itself (negotiated). Each of the four modes – which I term knowledge transfer, collective decision-making, choice and voice, and arbitration and oversight – has its own objectives and related forms of participatory practice, connected to distinct theoretical traditions. These are outlined in detail in the article and briefly summarized below. Participation as knowledge transfer is a relatively problem-free adjunct to what might be seen as the status quo of representative democracy and hierarchical public bureaucracy. Participation is about creating avenues to channel the voices of citizens, particularly those citizens with experiential expertise, so that they can inform the decisions of political leaders. It does not entail sharing the power to make the decision, which remains the preserve of policy-makers. It is intended to ensure that those policy-makers possess all the relevant information and can make the best possible decisions. Participation as collective decision-making is more associated with the participatory democratic tradition. It is about creating spaces in which people can debate and take decisions collectively as equals. Though radical democratic principles have influenced a number of institutional innovations, it is still rare to find this kind of egalitarian decision-making fully institutionalised in policy bureaucracies. The approach is primarily intended to realise political equality and ensure citizens are the authors of the decisions to which they are subject. Choice and voice is a more market-oriented approach. Citizens participate by making choices in a public services marketplace, and the aggregation of all these individual choices spontaneously produces collective outcomes. Alternatively, they participate through a range of customer insight mechanisms, such as customer feedback surveys and product-testing focus groups. Participation is thus individualistic, to make known one’s own preferences and ensure that services are responsive to these preferences. Participation as arbitration and oversight, in contrast, is associated with the idea of the state as a neutral referee that keeps individual self-interest in check and arbitrates between competing interests. When the neutrality of the state is compromised, citizens can participate to keep watch over untrustworthy officials, or as impartial adjudicators that can break through interest group deadlocks. Participation functions to ensure that power is wielded accountably and that decisions don’t favour the interests of one group. These four different modes of participation provide us with four different frames for thinking through the variety of different legitimate objectives and associated practices that may be embodied in different participatory initiatives. The typology can help us to illuminate the strategic choices and compromises we have to make when designing and engaging in participatory activities. The civil servant puzzling over who should participate in their process would come to a different answer based on whether she is trying to collect experiential expertise, realise political equality, or break through an interest group deadlock. The citizen deciding whether to engage or not could use the typology to make a much clearer assessment for what she is getting herself involved in, and whether she thinks it is legitimate. The type of participatory mechanism alone is often a poor guide, for instance; the increasingly popular ‘citizens jury’ has been employed for both arbitration and knowledge transfer purposes. Making explicit what are usually implicit assumptions about participation should result in more clear-sighted participatory designs, as well as a better fit between the rhetoric and practice of participation. This should lead to fewer failures and help diffuse the disillusionment and frustration with participatory governance that is currently experienced by both citizens and officials when delivery doesn’t match up to the rhetoric. Rikki Dean is completing a PhD in social policy at CASE, London School of Economics. He is also visiting lecturer, teaching ‘Innovations in Democratic Practice’ at the University of Westminster and research assistant at INLOGOV, University of Birmingham. He tweets at @Rikki_Dean, and more information about his research can be found on his website at personal.lse.ac.uk/deanrj. If you enjoyed this blog post, you might also like to read Depoliticisation, governance and political participation by Paul Fawcett and David Marsh.